What could be better than combining several pleasurable activities at once? Namely, writing, reading, and learning more about social history. I am doing what I might pretentiously call ‘research’ for a book. This means part finding books and articles at the library, part reading novels from the period being researched, and part, well, yes, ‘Googling stuff.’ I need everything from how did a Victorian tea-making machine work to the best train route from Vienna to Paris, to late nineteenth century fashions, to the Impressionist painters. Added to these pleasures is the fun of digging about in old books. In terms of information on the cafes, restaurants, and amusements open at the time, at the very start of what later was known as La Belle Époque, a true gift has been a copy of Baedeker 1874 guidebook Paris and its environs, published in the time-setting I am looking at. Herr Baedeker was kind enough also to give a contemporary potted history of the city, including the effects of the Franco-Prussian War, the Commune of Paris, and the establishment of the Third Republic (okay, I do need some political context, too). Baedeker advises like a wise friend on the best establishments at which to buy chocolate in the Passage des Panoramas or kid gloves on the rue de Choiseul, and books in English at Librairie Galignani, or snap up bargain ‘fancy articles’ at the Galerie Orientale. We can take in the many sites by day, stopping for coffee ‘in the forenoon’, perhaps a fruit-ice if it is summer, and in the evening dine on hors d’oeuvre of radishes, butter, and prawns or oysters, followed by crumbed cutlets, then a charlotte des pommes. Or maybe we would prefer to take in an operetta at l’Opéra Comique. Opening times of every garden, museum, shop and place of interest are given in precise detail, even suggested ‘daily diaries’ by which to plan one’s time laid out, along with expected prices and how much to tip whom. Like Paris itself, this book gives simply too much to take in all at once. 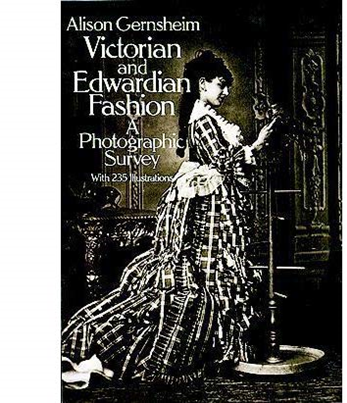 Published in 1981 but featuring a collection of authentic and dated photographs, historian Alison Gernsheim’s Victorian and Edwardian Fashion: A Photographic Survey has also been a useful source book. It draws the attention not only to matters of costume – the bustle that is ‘hardly noticeable’, or striped cuirasse bodice’ – but also hairstyling, an ‘enormous plaited chignon,’ for example, and even the certain style of a moustache. As I have blogged previously (here), reading novels and other literature written during the period can help to get the tone. This assumes people spoke as they wrote, but it is about getting a certain style of speech and the right references, of avoiding the anachronistic, rather than mimicry. 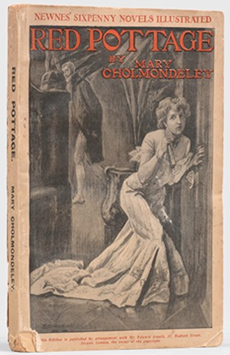 I have recently read a curiously absorbing melodrama of a novel with (pretty awful) title Red Pottage by English author Mary Cholmondeley­—set a fraction later than the year I am looking at, being published in 1899. The novel evidently caused a bit of a scandal at the time and features two strong women as its characters, and so chimes well with what I need. This has led me to look at other neglected female authors of the Victorian period. I have my eye on Rhoda Broughton, whose ideas caused a to-do for their “uncleanly suggestions”, and whose novels were evidently initially banned by libraries… And there are other authors’ names that I’d had no idea existed. So… One thing leads to another. It’s distracting stuff. The problem being, of course, that in getting bogged knee-deep into this fascinating exploration, it’s hard to find the time also to write. 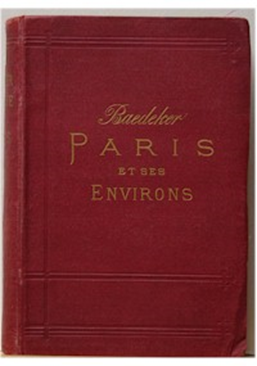 Baedeker, K. Paris and its environs, with routes from London to Paris, and from Paris to the Rhine and Switzerland, 1874, Coblenz: Karl Baedeker. Thanks, it’s huge fun – I could happily do this for hours. Shame about the day job! Contemporary books sound perfect, especially Baedeker’s guide. Social History is very interesting, there is just so much to learn from it. I agree, and I think learning about ordinary lives rather than those in power is much more fascinating. I was just talking with another author about research for writing. Because like you said, the info can be too much and very little of what i need, i usually start writing, and when i reach a place that needs detailed research, i do just that. of course, once the revisions and editing begins, i’ll do a lot more research and probably get lost reading all the stuff i may never use. I agree that a little can go a long way. For me, it’s about getting details right and avoiding the blatantly anachronistic (in the case of something set in the past) or otherwise just factually incorrect. Also true that only a fraction will get used; hopefully, though, a bit of ‘immersion’ in another time or world will help overall. I get your point. But in my case, if i do the research first, i’d only need to keep referencing back to the facts when i start the writing. so i do the writing – add some of the research i skim through, and once i get the story out, i’ll do the real research when i go over the story again. It probably takes longer, but this way i don’t mix things up or stop the flow of the story by much.. Yes, there are two broad approaches. I know other people who leave a temporary gap for research to firm up later, so as not to break the writing flow. I wish I was more like that – then I might not get so distracted!